More than $1 trillion is invested in new construction in the U.S. every year. Ensure your clients who own commercial properties are not exposed to significant out-of-pocket costs in the event of a claim. Commercial Property Coverage is designed to limit exposure to property damage, loss of income, stolen contents and other losses. Burns & Wilcox can provide coverage for virtually any tenant occupied building including stores, apartments, buildings and warehouses. The risk of property damage on a construction site is a significant concern for project owners, building owners, developers, contractors and subcontractors. This damage can result in severe, unexpected costs which can delay the building process or halt it entirely. Builder’s Risk Insurance (often referred to as Course of Construction, Construction All Risk, and Contractor’s All Risk Insurance) provides a specialized form of insurance designed to insure buildings or projects against repair or replacement costs while they are under construction and, in some cases, for a specified period afterwards. Sometimes an all-risk policy can exclude certain perils that your client may need covered. For example, floods are typically not listed exposures in a homeowner policy. However, if your client lives in a flood zone, their assets encounter different conditions and require supplemental coverage. Having the right coverage complement your clients existing policy can help limit the financial strains related to these conditions. Burns & Wilcox offers Difference in Conditions (DIC) Coverage as an extension to an all-risk policy which adds perils that are typically excluded. As each DIC policy is unique, it is important that you work with professionals who understand how to obtain policies that properly supplement your clients’ existing coverage. We can arrange for the customized insurance policies for each of your clients’ unique needs. Coupled with our extremely fast submission response time and low minimum premiums, Burns & Wilcox is one of the leading providers for excess and specialty insurance. Equipment used as part of today’s business operations often relies on delicate electronic components that can break down easily and be costly to repair or replace. While property insurance covers damages to equipment resulting from external causes, like fires and earthquakes, a different type of insurance is needed to cover expensive equipment breakdowns as a result of internal causes such as mechanical failure, electrical short circuiting, or motor burnout. Having an insurance policy that covers against these types of damages helps protect a business’ finances and allows them to continue to serve their clients. Apartment buildings are more than just a place for people to live – to their owners they are an investment and a source of income. From apartment fires to visitor injuries, owners can be held liable for costly repairs or medical bills. Having the right insurance policy in place will help protect against the financial strain brought on by unanticipated loss or liability. The commercial transportation or shipment of cargo can be a daunting task for operators. Regardless of the type of equipment or products you are moving, unforeseen perils can cause physical damage to the cargo. As a result, operators are exposed to a multitude of legal liabilities and can be left holding the bag for damages that occur while in transit. Inland Marine Coverage provides protection from the financial losses associated with property being shipped. It is important for your clients to routinely review and evaluate their current commercial property insurance policies against the real value of their asset. If their property is valued at more than what their policy states, then they should consider purchasing excess property coverage. By increasing their policy’s limits, your clients are assuring that their property is properly covered from financial risks. As a leading supplier of excess and surplus insurance, Burns & Wilcox can arrange for Excess Property Coverage. With fast quotes, competitive rates, excellent client service, and unparalleled access to markets, Burns & Wilcox has the breadth of products and experience you need to provide your clients with excess coverage. How confident are you in your Stock Throughput insurance? Many basic coverages do not offer the specialized protection you need to cover your assets. Thieves recently stole $500,000 of copper from a vacant building, with resulting building damage estimates exceeding $3 million. Vacant properties are increasingly vulnerable to copper theft as the metal’s value has skyrocketed. Subsequent property damage can often far exceed the value of the stolen copper. In addition to theft, vandalism and water damage also pose risks to unoccupied buildings. Pipes bursting or water intrusion from storms often results in costly damage due to the infrequent monitoring of vacant buildings. 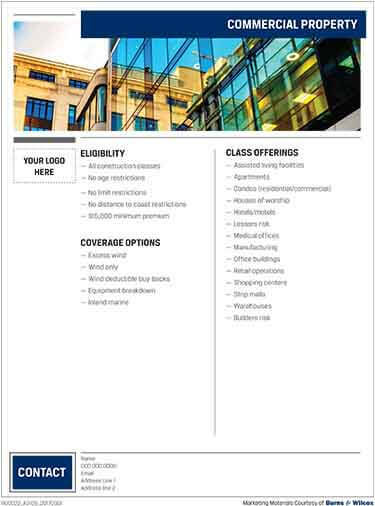 Vacant Property Coverage is designed to protect against financial losses relating to your clients’ valuable property investments during periods of short-term or long-term vacancy. Speak to your clients about the occupancy status of their investment properties in hopes of saving them from claim denial and out-of-pocket costs in the event of a loss. As the 10th anniversary of Hurricane Katrina approaches, we are reminded of nature’s capacity for widespread destruction. It is a good time for property owners in coastal areas nationwide to ensure they are prepared for the worst. A storm’s final path and impact are unpredictable until it hits land, and while this can create some uncertainty in the coastal commercial insurance market, wholesalers can provide the expertise and resources to manage the complexity and evolving risks associated with these violent storms. Nationwide subsidiary Crestbrook Insurance arrived on the property and casualty scene less then a year ago, targeting the affluent market with a range of strong coverage offerings, an agent-friendly value proposition and a distinctive customer-centric service model. What’s behind the newcomer’s fast rise? The impact of Hurricane Sandy has totaled anywhere between $20 billion and $25 billion in terms of insured auto, home and business insurance claims payments. A closer look at the numbers reveals Sandy’s devastation impacted a region that features one of the highest concentrations of wealth in the world. About 80 percent of Canadians live within 100 miles of the United States border. That proximity, coupled with a strong Canadian dollar and a slow-recovering U.S. real estate market, has created opportunity for growth in the high-net-worth market. Amid pronounced shifts in property market dynamics, agents are finding creative ways to weather the storm. Trying to place a property risk this year in Maryland, Rhode Island, Oklahoma and many other places is tougher than it used to be — and considerably more expensive. Please choose the application that best fits your needs. If you need additional assistance please contact your local office.